In an attempt to manage everything a little more centrally, Biz Miss has moved to my new site at laurenvenell.com. The tags and categories still need to be worked out a little better, so some posts might not be where you remember seeing them last. I promise this new organization will make MUCH more sense when it’s finished. I’ve got some very exciting posts lined up, including the introduction of an awesome new conference for creative professionals, some progress photos of putting together BIG Mitch, and a new web hosting service specifically for artists from our friends at The Present Group. because new posts will no longer appear on this site. Don’t worry, you can still get to all of the older posts on the new site. See you on the other side! I know it seems like I’ve fallen off the face the earth, but really I’ve just fallen very deeply into a project vortex. There’s lots to be done before WonderCon next weekend, and by far the largest undertaking (literally) is a seven-foot-tall version of Mitch the Monster for Neon Monster’s booth. Since I’ve never built anything of this scale before, I’ve had a few setbacks, mostly material-related. The structural engineering of an 18″ stuffed animal is VERY different from that of a larger-than-human-sized display. Wow, it must be wedding-planning season, because I’m starting to get a ton of e-mails again about our tree ring invitations. Neither A. nor I really have the time (or inclination, if I’m going to be honest) to create so many similar sets of invites for clients so I spent most of today preparing these invites as downloadable templates for Photoshop and Illustrator. They’re ready to go straight to the printer once you’ve entered in your own text, but they’re also fully editable so you can customize them as much or as little as you want. The templates are up in the Burning House Etsy shop already, and I’ll be adding them to the regular Burning House shop in the next few days. If you or someone you know has been coveting a set of these for their wedding, now you can create a unique set using your own text, fonts, colors and/or printers. You could even DIY the whole thing from start to finish if you like. Enjoy! Or so I gleaned from this video with Ira Glass, in which he reinforces the old Thomas Edison idea that “Genius is 1% inspiration and 99% perspiration.” Glass’s thesis is that if you know your field, and you have the eye to recognize that your work is not as good as it could be, then what is holding you back from greatness is not your lack of taste, it is lack of practice. I personally find this notion very reassuring, because lack of practice is something you can easily remedy with something like a Thing-A-Day project. Acquiring taste, on the other hand (as the judges on Project Runway will tell you) is much more elusive. p.s. I am still making a thing-a-day, but I have had to revert back to my original rules. I’ve always wanted to have an Oscar Party. The visuals are so dazzling on Oscar night–from the incredible gowns to the elaborate dance numbers–that it makes for the perfect party theme. So this year I’m taking the leap and actually doing it. I’m REALLY excited! My time is very limited these days, so I’m focusing just on games and food. 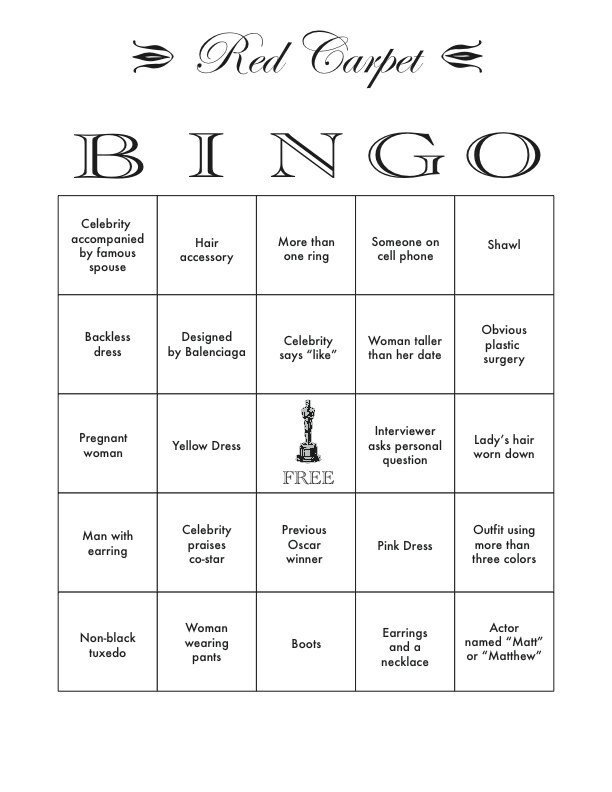 To start with, I’ve created twelve bingo cards for red carpet time, because we all know that’s when the show really begins. If you want to use these on Oscar night, click this link to download the pdf. I’ve designed them to be reusable year after year, so if you have an annual Oscar bash, you could laminate these and use them with dry-erase markers. You could even play several rounds this way. Before the awards, guests can fill out an Oscar scorecard to guess who/what will win in each category. I found a good one over at Rotten Tomatoes. At the end of the night, the best guesser wins! For the awards themselves, I’ve downloaded Jessica Jones’ Oscar Bingo cards from her blog How About Orange. I’m using cheesy $1 DVDs as prizes. I tried to keep the menu as simple and varied as possible, so I can get everything ready in under an hour, and no one would feel sick if they wanted to sample everything. If you’re low on ideas for your own Oscar party, feel free to use any of these. Do you have any advice for how to calculate prices for creative products or services? There are two main approaches to pricing your work: a bottom-up approach and a top-down approach. Visit Freelance Switch to calculate what you need to charge in order to live comfortably based on your business and living expenses. This is your break-even rate. Use this rate to charge for the hours you spend on non-skilled work like hole-punching or putting prints into plastic sleeves. Next, add some profit to that rate to cover your “intangible assets”—that is, your creative ideas and skilled artisanship. One good estimate is to add $3,000 of annual profit for each year of experience or education you have in your field. This new rate is your ideal rate. Use this to charge for the hours you spend on skilled work like sketching designs, brainstorming with clients or intricate beadwork. Add up the cost of all the materials you need for your project. This includes transportation/shipping or the time it took you to get those materials (at your break-even hourly rate). Many Biz Ladies find it easier just to add a mark-up of around 10% to cover these costs. If a material is particularly difficult or expensive to obtain, you may want to mark it up higher. You don’t need to include the cost of overhead (i.e. utilities, rent, office supplies) since this has already been figured in to your hourly rate. In order to figure out a competitive retail price, you need to know what other people are charging for their goods. Do your research by visiting stores, fairs and web sites that sell products similar to yours. Make sure you extend your search beyond huge online marketplaces like Etsy and eBay, where items are often bargain-priced. Pay special attention to products that share materials, style, process, or target customers with yours. For example, earrings made from a single plastic bead will not cost the same as earrings made from 24K gold cast in the shape of a spiderweb. If you’re having trouble finding pricing information on your own, do a bit of crowdsourcing. You can ask participants in certain forums on Etsy or Craftster what they would pay for your products. Limit your crowdsourcing to forums that specifically encourage this type of feedback. Good etiquette recommends that you avoid asking for advice from competing sellers or from posting links to your products in blog comments. Don’t forget to continue the karma cycle by offering your feedback to others in turn. Now that you have a good idea of what your retail price should be you need to decide whether or not you can afford to wholesale. Usually, a product’s wholesale price is about half of its retail price, so if intricately cast gold earrings are selling for $300 these days, their wholesale price would be $150. Now, let’s say it costs $25 in gold (including shipping) to make your spiderweb earrings, and each pair takes you three hours to make. Using the formula above, you can make $41.67 an hour for each pair of earrings you sell wholesale. Pretty good, right? But wait a minute, earrings don’t just sell themselves (no matter how talented you are). You spend your time on all kinds of things in order to run your business, so let’s take a monthly view instead. For simplicity’s sake, let’s say you only make 24K gold spiderweb earrings. You work full-time on your business (about 180 hours a month) and you are able to spend half of that time actually making your products. The rest of the time you are doing things like bookkeeping, shipping orders, and answering correspondence. Let’s also say that the overhead for your business costs around $1,000 a month. If you can live comfortably on that wage, you’re all set. Otherwise, you’ll need to make some adjustments. For example, you can buy larger quantities of materials to get better deals, or you can try to make your jewelry-making process more efficient. If none of these adjustments gets you to a comfortable hourly wage, you might want to sell that particular product only at retail. Many designers who make high-priced items but still want to reach a wider audience will create a second product line that is specifically designed for wholesaling–for example, a line of less expensive earrings where the spiderweb design is stamped into a square of gold-plated metal. Pricing is part of the marketing plan in my business plan template. This doesn’t make any sense to me. Why is it in this section? Marketing encompasses more than just advertising. It’s comprised of everything that influences the way people see your business, and that includes your prices. For example, while it may seem counter-intuitive, raising your prices can sometimes boost sales by making your work seem more desirable. At a Biz Lady meet-up in San Francisco years ago, I participated in a group session led by Meg Mateo Ilasco, author of the excellent business book for crafters, Craft, Inc. She described how she had decided to ramp down her wedding invitation business by doubling her prices. Instead of causing fewer people to hire her, however, it more than doubled her number of clients. The higher prices made her look like a more sought-after designer, which became a self-fulfilling prophecy. Of course, raising your prices doesn’t always cause a stampede. The trick to maximizing your sales is to bring your prices in line with the rest of your marketing, including the taste and craftsmanship of the work itself. Whether you make stylish home furnishings or adorable character art, your prices should not surprise your target audience, and should look right at home on your packaging, on your web site, and in the stores and galleries that sell your work. I cut my prices pretty drastically for a craft fair this past weekend to try to get rid of some inventory. I have a day job, so I just need to cover my costs. Another vendor selling similar stuff got angry at me and accused me of “threatening her livelihood.” I think she was totally out of line, but my friend disagreed. I don’t get it. Every business is free to set their own prices, right? Changing your prices too often: yes, you should absolutely market-test your prices, but don’t just throw numbers out randomly to see what sticks. Focus on testing one or two products at a time, and try to do it at a live event like a craft show, where you can gauge customers’ reactions directly. Changing your published prices too often (like the ones on your web site) will make repeat retail customers think they are overpaying, and will make your wholesale customers struggle to keep their prices current. Pricing just to maintain your hobby: I think it’s lovely that you make so many beautiful things that you’ve run out of people to give them to. I also think it’s great that you sell your extras in order to support your hobby. It’s selfish, however, to sell a fair-isle sweater you knitted for just the price of the yarn. Your customers might be thrilled, but underpricing devalues creative work and makes it harder for creative professionals to make a living. Sadly, there is no magic formula for pricing, but with some research, careful thought, and a little finesse, you can find the sweet spot that makes your business the most successful it can be. If you have any other pricing tips or questions, please feel free to share them in the comments below. I’ve written a few posts before about my own experience with accepting credit cards, but I’ve finally put all of info together in one place. Enjoy! When I first decided to start taking credit cards, it took me weeks to sort out the fees, the terminology and the parties involved, and even longer to feel secure that I was buying what I needed at a reasonable price. To save you some of that hassle I’ve laid out the process below. Step 1: Estimate whether your business can afford to accept credit cards. For a small business, accepting Visa and Mastercard for in-person or phone/fax/mail sales will cost you around $25 a month, plus 3.5% of each transaction, often with a $20 monthly transaction fee minimum. If you want to accept credit cards through your web site, add another $20 a month for a gateway, shopping cart, and/or SSL encryption (more on this later). you can estimate an increase of about 25% (I found this to be true for my own business). for in-person sales like those at craft fairs or brick-and mortar stores, you can estimate an increase rate about equal to your average sale. In other words, if your average sale is $20, you can estimate about a 20% increase in sales from credit cards. Here’s a quick example: if your monthly sales average $500 and your typical sale is $10, you can expect $50 more each month in sales (a 10% increase), but your processing fees will eat up nearly all of it, so it might make sense to wait a little longer before signing up to take credit cards. Step 2: Know what you need. Depending on your business, you may need some merchant services and not others. It’s important to figure this out before you start searching for a “merchant service provider” so that you don’t end up paying for products you don’t use. Susie buys a handmade scarf from you for $50. She hands you her Washington Mutual Visa card. You swipe or imprint the card and she signs the receipt. You send the information about the card and the transaction to your merchant acquirer. You might type this in yourself on a phone or through a website, or it might get sent automatically if you swipe the card using a terminal. The acquirer sends the info to Visa, and then Visa sends the info to Washington Mutual for verification. If everything is cool (i.e. the card number is valid, Susie hasn’t exceeded her credit limit, etc. ), Washington Mutual authorizes the transaction to Visa. Visa tells your acquirer that everything is approved. Your acquirer keeps a record of the authorization for later (called “batching”). Your acquirer takes the batch of all the approved credit card transactions you made that day and sends them back through Visa for payment. Once the acquirer gets paid, they put $50 minus their transaction fee into your merchant account. Usually, the money is then transferred to your business’s checking or savings account the following day. Now that you know how it works, it’s time to decide what you need. You’ll need most basically to decide on your merchant account, equipment, and in some cases, your processing method. You might have to do a bit of math to figure out the best combination of fees for your business. If you have low monthly sales, for example (like if your business is part-time), your best bet is a merchant account with low monthly fees even if it means higher transaction fees. If, on the other hand, you make a lot of small sales ($10 or less), you’ll want to look for a merchant account with percentage-only transaction fees (3.5%), rather than fees that take a percentage plus a fixed charge (3.0 % + $0.50). Propay is a popular merchant account with small-volume businesses. “Knucklebuster” credit card imprinter: This is the old-school sliding machine that physically rubs the credit card info onto a receipt. You need to get the name plates for these directly from your merchant services provider. Pros: portable, don’t require electricity or a network connection, inexpensive ($25 for machine and name plate and $20 for 100 receipts). Cons: inconvenient, require manual entry of transaction info, offer no instant authorization. Best for: craft fair vendors or people who need a cheap, portable device to use occasionally. Processing method: manual entry of all data via “MOTO” processing (telephone) or “virtual terminal” (online form). For an extra fee you can sometimes add cell phone processing to get instant authorizations while on the road. Credit card terminal: this is the machine that you swipe your card into. Some print receipts directly, and others connect to a computer or cash register running “Point-of-Sale” (POS) software, which might cost extra. They need to be hooked up to a phone or data line, but this can be done wirelessly. Pros: convenient, offer instant authorization (and therefore cheaper transaction fees), can be integrated directly accounting software like Quickbooks. Best for: people with brick-and-mortar stores, offices or studios who process a fair number of credit cards each month. Shopping cart and payment gateway: these are web tools you need to process credit cards through an eCommerce site. The shopping cart collects your customers’ information, and the payment gateway transmits it securely to your merchant acquirer. If the checkout page of your shopping cart isn’t secure, you might also need to add SSL (Secure Socket Layer) encryption to your site. Your web host can usually provide this for about $20/year. Shopping cart: Shopify, Zen Cart or Mal’s eCommerce. Payment gateways: Authorize, LinkPoint, and Paypal’s PayFlow. Combo merchant accounts/shopping carts: Paypal Merchant Services or 2Checkout. Pros: convenient, offer instant authorization, allow you to take credit cards over the internet. Cons: requires separate monthly fees, can be complicated to set up, not all shopping carts work with all gateways. Best for: people who want to set up web stores that move beyond Paypal. Phew! That’s a lot of options. Now that you know what you want to buy and how much you can afford to spend, it’s time to take the plunge. Do some research to find a short list of companies that offer what you need. You can get suggestions from your bank, your credit card issuer, or your local chamber of commerce. You can also let your mouse do the walking, but make sure any companies you find through the web are reputable by checking references or the Better Business Bureau. Call the sales department of each company. Salesmen will often waive or lower fees, especially if you present them with a competing offer. You can also negotiate combo deals this way, such as a discount for adding a payment gateway for your web site. When I did this step I kept the most current rates for each company in a spreadsheet for easy access and comparison. Be aware that most merchant service providers will run a credit check on you and/or your business before giving you a merchant account. Your credit can affect the fees that they charge you. If you don’t have a separate bank account for your business, now is the time to open one. Even if you’re a sole proprietor, it’s always a good idea to keep business and personal finances separate, and some merchant acquirers will not give you a merchant account without a business bank account. Get your best offer in writing. Read it carefully. If everything looks good go ahead and sign up. Ask a friend or family member to “buy” something from you so that you can run a test transaction. Make sure everything goes smoothly on both ends before accepting cards from customers. I hope this helps to remove some of the mystery and confusion from opening a merchant account. It can be a long process but it’s worth it to do things carefully and correctly the first time. I’ve had my merchant account and gateway for three years now and I’ve never had a problem or a chargeback. For more resources, check out some of the links below.